Very well organised, full of interest. Delicious snacks. 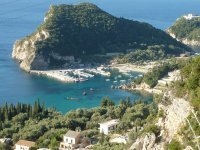 Corfu guided walking holiday 2019. Our sixth year. 9th - 18th October. 10 days 9 nights. 2019 Wednesday October 9th - Friday 18th. We are walking for the sixth year in a row and it is our most popular overseas trip that includes 5 full days of walks, plus an exciting day trip across to Albania to the port of Sarande and the UNESCO archaeological site of Butrint. Last year was our first year to do this and it was a great success. 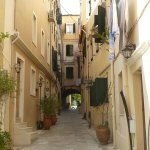 There is also a guided town walk in Corfu Town where we will be staying for six days before a transfer to Kassiopi in the north of the island. The holiday includes many extras that you will not find elsewhere and you will get a local perspective of the Green Ionian Island and its many cultural and historic stories. Don't forget you can buy the DVD of ITV's The Durrells to get a flavour of the island. They are filming another series too. 2018 we went to the special site where they film a lot of the scenes and often we walk past some of the scenes in the series on our day walks. Also check out this link. 9 nights with 5 full days of walking, half days ambling and visits stretching over 10 days. 2019 dates Wednesday October 9th- Friday 18th. 2 wonderful hotels for 6 and 3 days respectively; in the capital Corfu Town (Kerkyra) and in Kassiopi a historic coastal village on the North East coast. One experienced and knowledgeable local guide plus myself (Paul of walkitcornwall) and various experts accompanying us on some of the walks. 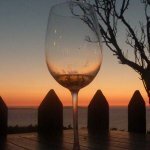 Lots of extras (see below) including 2 welcome meze meals, lunch in a taverna up in the mountains, a full day around Corfu town, 5 picnic lunches, CD-ROM of your trip and much more. 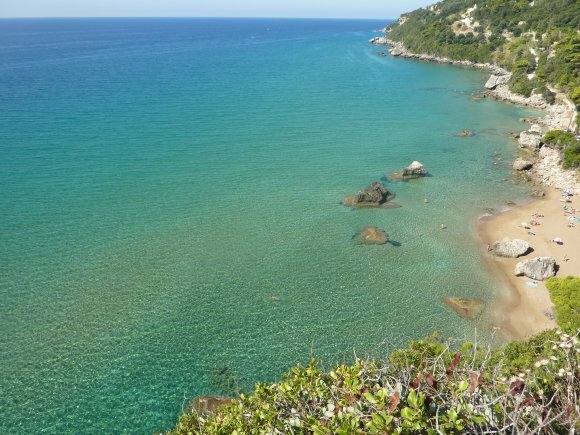 Walks are varied, along the coast and in the mountains including selected parts of the official 220kms Corfu Trail. This trail unveiled in 2001 crosses the island and runs north-south yet takes in a lot of the western and eastern coasts and the northern mountains and hills. We go walking in Corfu on the trails and footpaths that have enabled ancient people, pilgrims, farmers and visitors to traverse the greenest island in the Ionian collection of islands. 2019 will be our 6th year. We walk in October as the island winds down from a busy summer season so we walk when the island is alive with autumn flowers where we walk. We explore the mountain villages and the coast, ambling in olive groves and woodlands visiting the parts unaltered over centuries. The hospitality is open, enthusiastic and giving when all one needs to do is greet the locals in their own language with a cursory "hello". Arrive on a Wednesday 9th October. Thursday we have a day out together in Corfu Town with a Blue Badge guide and our host Sue our local agent. 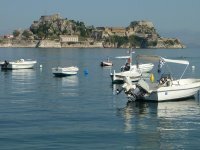 3 full days of walks based around Corfu Town and Paleokastritsa. Day trip to Sarande and Butrint across the water in Albania. Tuesday 15th is the day to move hotels and enjoy a coastal walk or relax around the traditional historic coastal village of Kassiopi. 2 more full days of walks based around Kassiopi, northern Corfu. Depart on Friday 18th. You can extend your stay if you wish. 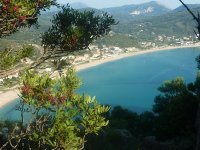 Beautiful beaches, woodlands, olive groves, ancient tracks, pilgrim routes and mountain passes away from the tourist gaze. We will be walking with local guides and other experts experiencing the archaeology, geology, architecture, Greek mythology, Byzantine, Venetian, French and British influences, the Greek Orthodox religion and the wonderful flora and fauna. We will eat locally sourced and freshly grown and caught food catering for all requirements. Corfiot hospitality is renowned for being friendly, helpful and relaxed. "Avrio" is manana without the sense of urgency. Picnic lunches on all our walks and day trips (the day trip to Albania). At least two guides on each walk. All transfers to and from the airport and between hotels. Professional guide for part of the whole day where we walk around the vicinity of Corfu Town. Two welcome meze meals plus lunch in a wonderful taverna in Old Perithia up in the mountains. Natural history experts accompanying us on walks. CD ROM sent post holiday of the photos taken on the trip or on Dropbox to share.